For most of my life I have focused on the Western Theater (Kentucky, Tennessee, Georgia, Alabama, etc. ), because I lived in those places and traveled to them easily, both on my own time and for the National Park Service. In more recent years, especially since I moved to Massachusetts, I have been catching up on all things going on in the Eastern Theater (Virginia, Maryland, Pennsylvania, etc.) I recently read Gordon Rhea‘s excellent books on the Battle of the Wilderness and the Battle of Spotsylvania. I am hoping to get more of Rhea’s books, and maybe some books by other historians like Noah Andre Trudeau. Thank God for ABE Books. Previously I might have talked about the Battle of Shiloh since it began on April 6th, 1862 since that was Western Theater. Now I want to talk about what happened on this day in 1865, when the Battle of Sailor’s Creek, the last major battle between the Union armies under Lieutenant General Ulysses S. Grant and the Confederate Army of Northern Virginia under General Robert E. Lee, took place just a few days before Lee finally surrendered the ANV on April 9th, 1865. The Confederates were trying to escape from the pursuing Federal armies (there were three, technically: the Army of the Potomac, including my ancestor; the Army of the James; and the Army of the Shenandoah) when their long wagon trains caused a traffic bottleneck over the two bridges over Sailor’s Creek and Little Sailor’s Creek. The battle developed in three different places, with my ancestor and his unit fighting at Lockett’s Farm. His 11th Massachusetts Infantry was then part of the Third Brigade, Third Division, Second Corps, according the Order of Battle for the campaign. Brigade flag for 3rd Brigade, 3rd Division, Second Corps. I will have to get more information on the specific actions of the 11th Massachusetts and the Third Brigade because I simply don’t know much about what they did, but I do know that their division captured many prisoners and wagons, and also a number of artillery pieces and Confederate unit’s battle flags. At a cost of some 300 casualties, the Second Corps as a whole captured over 1,700 prisoners, 4 artillery pieces and 13 Confederate battle flags. 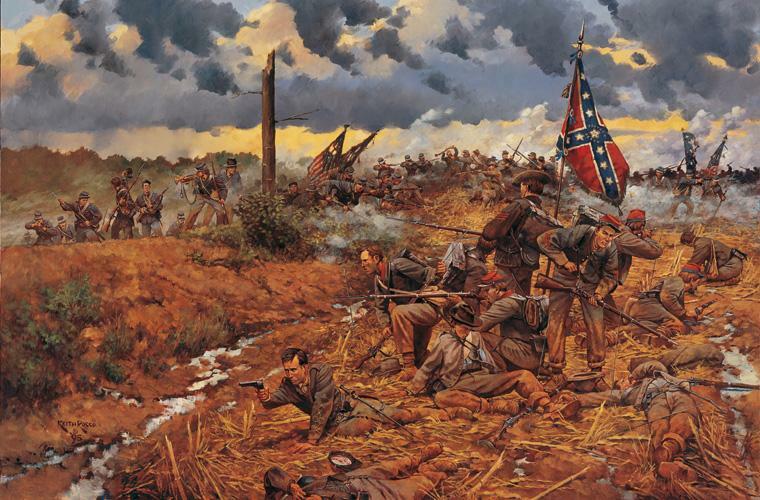 In this painting by Keith Rocco (one of my favorite Civil War artists), a group of Georgians at Sailor’s Creek is shown fighting until they are overwhelmed by Union troops. Many Confederates at Sailor’s Creek saw no point in continuing to fight, and so they surrendered. As a result, about 7,700 men, or between a fifth and a quarter of what remained of General Lee’s army, were taken prisoner by Union forces. Among those captured were 9 Confederate generals, including corps commander Lieutenant General Richard Ewell and Major General George Washington Custis Lee, General Lee’s eldest son. General Ewell was actually held as a prisoner here in Boston as he was one of the high-ranking Confederates confined at Fort Warren in Boston Harbor. I am still learning more about Moses Beaulieu and his Civil War career. Most recently I discovered where he was buried, and even found this photo of his grave online at Find a Grave. You can see that he lived through the whole war, but it apparently shortened his life as he died in 1866, just a year after the war ended. 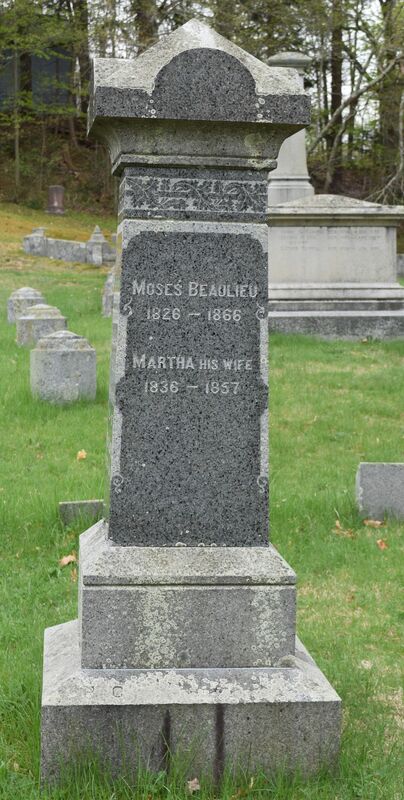 The South Weymouth grave of Moses (Moises) Beaulieu and his wife Martha.